Stories that appeared on Great Day Houston, KHOU, Channel 11 Houston, TX. This story aired on Great Day Houston on June 15, 2016. All the details about the products shown are provided below the video clip. The Houstonian Hotel for providing the beautiful setting for the segment. A special thank you to Sabrina Cook for modeling and Crystal Johnson for helping behind the scenes. Thanks for watching! Protecting our skin is one of the most important and least expensive measures that we can take to preserve the health, youth and beauty of our skin. 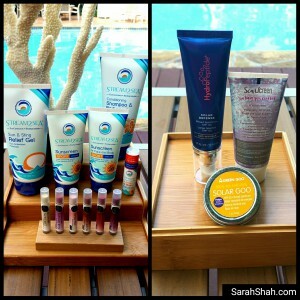 We all know about sunscreen lotions and sprays, here are some products you might not expect to provide sun protection. Ultraviolet Protection Factor (UPF) is the term used to define the level of UV protection in clothing. The white t-shirt we usually wear as a cover up has a UPF of 7 and drops to 3 when it’s wet. The Skin Cancer Foundation recommends a UPF of at least 30. Synthetic materials with a tight weave. If you can see through the fabric, then UV radiation can penetrate it – and get to your skin. Clothing with a UPF rating of at least 30. A UPF of 50 is excellent and blocks 99% of the sun’s UV rays. UPF clothing is available in most sporting goods stores and online. 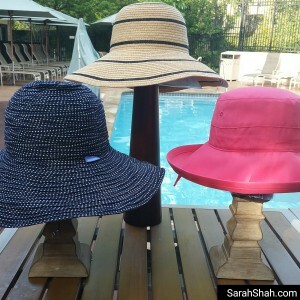 Hats can protect our face and shoulders from the sun, but many don’t. The typical straw hat has a loose weave and lets a lot of sun through the little holes between the strands of straw. 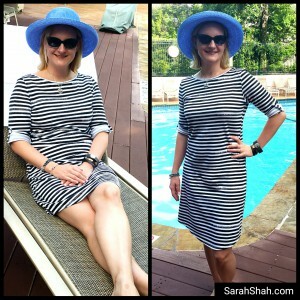 Look for hats with a tight weave, wide brim, and UPF of at least 30. The bigger the brim, the more protection. These bracelets are pretty and conceal UV indicators and monitors. The June bracelet ($129) and Microsoft Band 2 ($175) both conceal UV sensors that work with your smart phones to track your UV exposure. When we’re in the sun, the pupils in our eyes contract to reduce the light that enters our eye. Sunglasses shade our eyes, so the pupil opens wide and over-rides your body’s natural defenses against the damage of UV rays. If the sunglasses don’t have 100% UV-protection we cause more damage to our eyes. 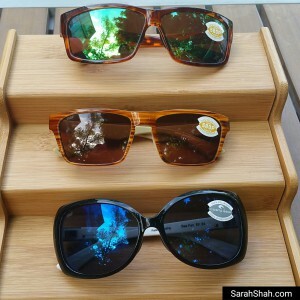 Choose sunglasses with 100% UV protection. Look for the label on the lenses of the glasses. With sunglasses, the more you spend the better protection you can get. Inexpensive glasses have a UV coating that can rub off after just a few wears. These Costa sunglasses by have polarized lenses and different coatings embedded in the lenses that are specialized for different conditions, so you can get just the right glasses for your specific needs – driving, harsh sun, open water, variable light, etc. ($150 = $250). 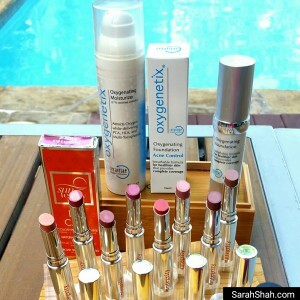 Oxygenetix foundation has an SPF of 25, is lightweight and stays put even in hot humid weather ($50). Nailpolish – all nail color blocks the sun’s UV rays ($28). Sea2Stream has a whole line of sun and body care that is biodegradable and reef safe (15). All Good’s tinted lip balms feel great, come in pretty colors and have reef-safe sun screen (5). Scars/Tattoos – Dermaflage Scarscreen is a sunscreen that is especially made for the fragile skin of tattoos, scars and effected by laser resurfacing, microderm, medical procedures or common scrapes and scratches ($25). Gluten Free – Gluten is in lots of unexpected products and people with gluten sensitivities can’t use them. Hydropeptide’s Solar Defense is gluten free ($44). Natural Products – Solar Goo is made from all natural products and is still affordable ($8 – $13).